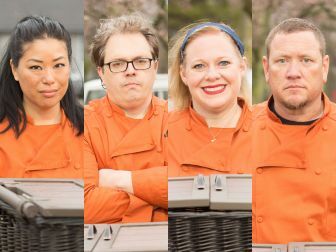 Tonight on Food Network is the Chopped Grill Masters finale where the winner will go home with $50,000 in cash. The finalists competing are Chris Hart (episode 1 winner), Stan Hays (episode 2 winner), Leslie Roark Scott (episode 3 winner), and Angie Mar (episode 4 winner). On tonight's final episode, the contestants have to cook with rattlesnake in the first round, offal and fruit in the entree round, and a breakfast item and classic pie for the dessert round. I will update this post with the winner once the episode airs. This is the second Chopped Grill Masters tournament with Ernest Servantes winning the first one. Update - Leslie Roark Scott was eliminated first, followed by Chris Hart. Then in the dessert round Angie Mar defeated Stan Hays to win the $50,000 and was crowned Chopped Grill Masters champion.